Now that I have a fireplace in my home I expect my ashes of community to get a longer pedigree. 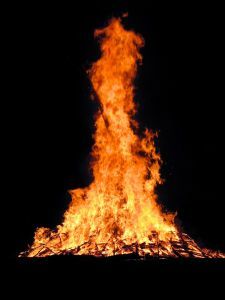 We had ritual fires for both Yule and Christmas, because a fire in the fireplace just makes everything better. The last time I tried to post a list of my ashes turned out pretty messy, so now that I know how Google Spreadsheets works with blogs I won’t be doing that again. Not only are there missing columns, making it impossible to read the list, but the post lacks any context other than the introduction to the list itself. It’s a fine introduction, but I picture someone happening upon that post as they surf the web and . . . just surfing away. Hopefully my writing will get better, like fine eggnog. So I keep my own list of ritual ashes someplace where it can be found, but that kind of convenience has confused some people. I’ve had people offer to send me ashes from distant fires – it’s a kind and generous offer, but it defeats the purpose! How I want to get the ashes from powerful, moving, and stupendous ritual fires is by having you collect them and then put them in a fire when I’m there. I am always honored when I am permitted to put ashes into a ritual fire, and it’s even more exciting when someone else does it too! I was at a fire once when five or six people stood up and recited the pedigree of the ashes that they were adding to the mix – that’s pretty intense! I love the mystic quality of the 30,000-year unbroken tradition that led to modern Witchcraft, whether or not there’s the slightest evidence that it’s true. I think the Ashes of Community can, or will, have that same romantic power; I just love the thought that the ashes in my little container includes remnants of rituals in places I’ve never seen. I want someday to have ashes from rituals that took place before I was born, but I don’t know if anyone’s got any ritual ashes that old – I may have to accept 1990 as the most ancient date for this tradition. Nevertheless, if you attend a ritual that I’m at, bring a little box or a film container or a ziploc bag and you can get some ashes that include the fire we lit for our Yule celebration, and the one that kept us company during Christmas dinner. I hope you’ll bring some of your own Yule log ashes and share, but I’ll give you some just for dancing at the fire with me. I’ve been driving a hybrid car since January 2004. I didn’t get a hybrid because I was interested in saving gas, which is a good thing since shortly thereafter I started a period of adding serious miles to the car. Weekly 200-mile round trips for eight months followed by an entrepreneurial period (read: driving to visit clients). Hybrids can’t be justified in gas savings, since the prices on these cars spikes whenever the gas prices do; I got mine because it’s got 97% fewer emissions than a gas-only car. Enter the brilliant wife (she likes it when I say that, mostly because I only do so when I mean it) and her amazing Yule gift, a TerraPass. I was introduced to the concept many years ago by my friend Barb, who has been passing them around at the winter solstice for quite some time. 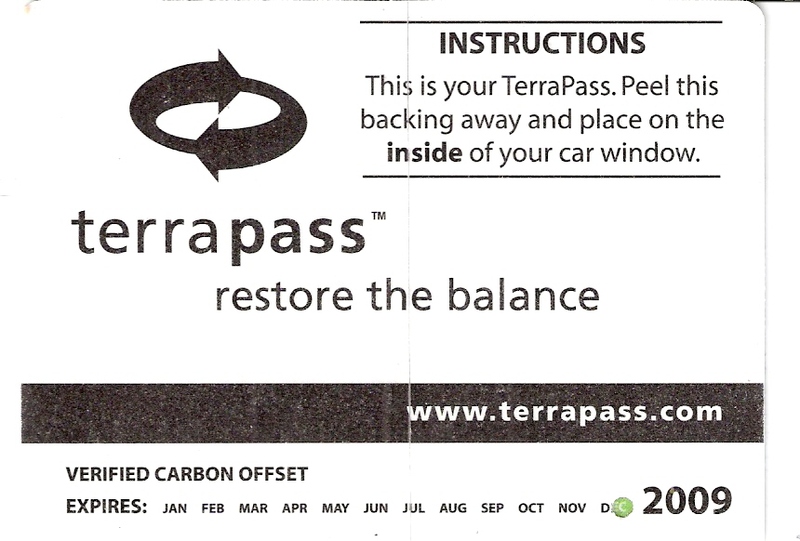 For 2009, the already-reduced carbon footprint of my automobile is being offset still more; Robin (my brilliant wife) converted the energy of her labors into money, and used that to buy a TerraPass. That money will be used to invest in more renewable energy resources, contributing to the likelihood that the next time I have to buy a car it won’t run on fossil fuels at all. I’m one of many Americans who has been so sucked into our car culture that I’m unable to reduce the amount of driving that I do more than I already have. I’ve moved my income as close to home as I can, I’ve all-but abandoned my friends outside of town except for special occasions, and I walk for local errands whenever it would not be prohibited by needs of cargo room, my failing limbs, or really crappy weather that simply will not take “no” as an answer from my meager protective foul-weather gear. Incidentally, I have a coupon for TerraPass merchandise that needs to be used by January 31, and I don’t expect to use it. It’s “not valid on carbon offset or gift certificate purchases,” but there may be something else on the site that one of my readers would like 10% off on. Money is congealed energy, and releasing it releases life’s possibilities. Pagans have assorted new year’s days – I’ve celebrated the new year on Samhain, Beltaine, and the beginning of the new television season myself – but the cultural association with January 1 is the strongest one for me. So, it’s time to set goals for this blog for 2009. I’ve always been fascinated by the relationship between Pagans and their money. I remember ten years ago thinking about giving a class on the topic at Etheracon, but I never pulled together the material. In 2009 I’m going to keep the money theme in mind and try to return to the pagan-money relationship at least monthly. It’s a love-hate relationship that is worth exploring. I’m also going to try to include a picture or video from time to time, just to mix things up. This is a ritual I just kind of made up, and I think it’s got a few gaps, but the idea is clear enough. Place bare hand against the tree. Tree, I am _____________. Today I am asking you if you will lay down your life to join my family as we welcome the return of the sun. If you agree to this thing, I promise that you shall be honored. We shall celebrate you in lights and finery, surround you with joy and hope, and praise your sacrifice. We shall ensure that your remains nourish the Earth so that your spirit will never die. Tree, I am _____________. You have laid down your life, and if your spirit is willing, I ask you to join my family as we welcome the return of the sun. I promise that you shall be honored. We shall celebrate you in lights and finery, surround you with joy and hope, and make your death into a meaningful sacrifice. We shall ensure that your remains nourish the Earth so that your spirit will never die. Tree, I thank you for considering my request. May your days be blessed by bud, root, and thorn. Place the tree in a cold, sheltered area until it is time to set it up. Cut off the bottom of the trunk to allow for better water absorption. Dissolve the measures of honey into a hot cup of water. Stir this into enough water to fill the tree stand. The men should set the tree up in its stand. The women should add the water. Surround or gather near the tree and sing a carol of your choosing to the tree. Repeat daily. The idea came out of writing an article on the Care and Feeding of Cut Christmas Trees. Suggestions and feedback welcome. What would you add? A lot of things have helped form my attitudes about giving gifts, but I think that couples gifts pushed me over the edge. It’s the thought that counts, right? I always took that to mean that thought should go into choosing a gift, because it should be something that the recipient will appreciate. It’s a tangible expression of your feelings for that person, whether you want it to be or not. So how do you select a gift for a couple? No matter how close two people are to each other, they aren’t identical. Each of them has different interests and passions. If you get a single gift for two people, and you choose it well, it will probably only relate to those things the two people have in common. Couples gifts tend to be rather generic and bland as a result: holiday-themed items, coffee table books, some hand-stitched dish towels. Very nice things, but when you’re shopping for two as one your selection tends to only represent part of your relationship. Couples gifts started me realizing just how insincere some gift exchanges are. I set a pretty high standard for myself: I really don’t want to buy a gift for someone if I don’t know what they want by my own observation. I feel like I ought to be able to pick a gift for someone without asking them for suggestions. If I can’t, then I probably don’t know that person well enough to be getting them a gift in the first place. That can change from year to year, too; changing jobs or homes or hobbies can all change how well I know any particular person. Not giving a gift can be tough, and sometimes I buy something generic because it seems like the lesser of two evils. If I can’t figure out what you want without asking, I reason, then the thought represented in my gift should be that I feel enough fondness to want to give you something, but we aren’t close enough for me to have a clue what to get. Presto! I get a spoon for the rack on your wall. I have a college friend whose family has an informal rule – everyone must have a collection. It makes it easier to buy gifts, you see – I know Katie collect monkeys, so it’s off to Make-a-Monkey Workshop. Simplifies the process, but I think it takes the effort and thought right out of the equation. I felt the same way about my mother’s practice of buying gifts for herself throughout the year, which my father would sell to us kids so we could wrap and give them. If Mom put in all the effort, then what does that say about my relationship with her? My parents absolutely taught me to abhor giving money as a gift. I recall them giving me money once, and I got my ear pierced with it (and trust me, shoving a rolled-up twenty through your ear is no fun). Since they never did it, I learned that it’s a Bad Thing, and that jibes with my attitude about putting thought into a gift. Of course, I’ve come to understand that money is energy, so how should that change my attitude about giving it? Well, if I were to give my friend a kilowatt hour of electricity, what does that say about our relationship? Maybe there are times when money is an appropriate gift, but it’s not my first choice. However, there is certainly a place for the office gift collection. If you’ve worked in an office, you’ve been asked to put money in for Betty’s baby or Dennis’ engagement from time to time, and I rather like the idea. My rationale is that this is when money is channeled much like magical energy can be in a Cone of Power. The Collectress is asking all of you to channel a portion of your energy (five bucks or so), and she will focus the energy towards its intended recipient. The person focusing that energy is much more likely to have a good idea for an appropriate gift than I do, so I can relax my threshold of when it’s appropriate to give. To do for 2009: bring back my music. I don’t have any sound on my computer, and it matters more now. I used to do most of my music listening on CD and tape in the car, but I drive less, and much of my music is on my computer, so I hear much less of it now. This time of year I particularly enjoy music, since so much of it is stuff I can sing along to. I lost my sound when I reinstalled Windows two or three years ago – something very minor went wrong, and the sound drivers didn’t install properly. I downloaded them fresh from Dell and again they didn’t install; 45 minutes on the phone with their tech support had the employee take me through the same procedure, with the same result. He told me my only option was to reinstall Windows. I had finished that process oh, two hours before the conversation, so I decided to live without sound. Well I still have no sound, and I still have the same computer. I don’t mind how bad it makes my YouTube videos (example below), but this is the time of year when I really tend to miss out on the music. There is sooooooo much really bad Christmas music out there, and only on my computer may I be selective and only listen to the good stuff. So maybe this is the year to reinstall Windows. That post by Doc Searls explains the no doubt unpopular opinion that sometimes pain is part of the healing process. I understand that thousands of people have jobs that could be lost, and if managed badly, Detroit and other areas of the country are in for a long period of unnecessary suffering. But really, this bailout just doesn’t make sense. Nobody’s buying because credit is frozen, the industry magnates explain ruefully. Sounds like money’s a bit like blocked chi here. Maybe the best way to get the energy moving – encourage people to buy cars – is to sell cars we can afford to buy without financing. Nobody’s negotiating in good faith for pay cuts, because the unions themselves are more interested in continuing to exist than they are in their members’ needs. The best thing that happened to human rights in this country was collective bargaining; one of the worst was allowing unions to require membership to hold a particular job. Without that, the concept of the full-time union employee would fade away and unions would be forced to really negotiate. Nobody’s greedier than car designers, and we deserve them! They will sell the largest and most inefficient vehicles the market will bear, and have frequently raked in stupendous profits. With gas prices plunging, I don’t expect many more hybrids to reach market because Americans have zero short-term memory. Auto makers take advantage of our collective inattentiveness, but that doesn’t mean we should bail them out just because nobody’s buying what they’re selling. I don’t support a bailout because it will just be sending good money after bad. However, it’s high time we spend at least that much money figuring out what technologies are necessary to get auto workers employed in a successful industry again if this one fails.